Excellent hands-free audio, flexible mounting options, fast iPhone charging, the perfect partner to the TomTom iPhone satnav app. 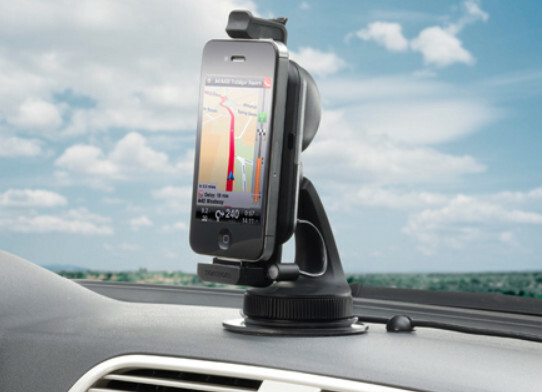 TomTom, king of the in-car satnav market, has finally launched a hands-free car-kit for the iPhone in the UK. Primarily aimed at those people who want to make and take calls both safely and legally (it is illegal to use a hand-held mobile phone whilst driving in the UK) this kit takes on a whole new dimension when used in conjunction with the latest iPhone TomTom satnav app. I have been a happy user of TomTom satnav products since they first hit the market some ten years ago now. For the most part, that has meant dedicated hardware for in-car use. However, when I last reviewed the TomTom app for the iPhone here at DaniWeb back in 2010 it got a perfect 10/10 rating, the upgraded software truly being that good. In that original review I briefly mentioned that TomTom has a car-kit available for the iPhone which would charge the battery on the move and provide a GPS boost for those poor-signal areas. It also acted as a useful holder for the smartphone, but wasn't cheap and didn't include hands-free calling functionality. Now all that has changed with the release of not only a hands-free car kit for the iPhone, but also a navigation pack that rolls in a download voucher for the satnav app as well. I have been out on the road this last week, putting it to the test. First things first then, and that's pricing. Please bear in mind that this entire review is for the UK version of the hardware, and I am using the UK version of the iPhone app as well, so your mileage may vary (if you will excuse the pun) depending upon the country you live in. OK, the TomTom Hands-free Car Kit for the iPhone comes in two varieties: plain vanilla hardware only at £79.99 and the 'Navigation Pack' which includes a download voucher for the Western Europe satnav app as well at £129.99 which, when you work it out, represents a saving of £10 over buying them separately. Some may well balk at the thought of spending £80 on a hands-free car kit when the iPhone itself, courtesy of Siri, already allows you to make hands-free calls. A car friendly cigarette lighter or USB fast charge cable solves the 'satnav apps eat iPhone batteries for breakfast' problem, so why would you invest in the hardware at all? There is no one compelling reason that I can offer in response to this question. Instead, the actual answer only becomes clear when you combine all the disparate functions and benefits of having everything rolled into this one hardware device. There's the simple fact that it gives you somewhere to safely mount your iPhone while driving at one end of the argument, for example. Either firmly windscreen mounted using the clever 'dial-twist and stick' sucker mechanism that makes dismounting just as quick and painless, or on the dash/centre console via the slim and discrete mounting pad which adheres to the dashboard surface instantly and allows the same sucker mount to work perfectly. The arm that holds the iPhone itself has a brand new design quick release and fully adjustable grip which means that your iPhone can happily stay in the case when you are using it in-car, and a ball-joint enables the iPhone itself to be mounted in either portrait or landscape orientation with equal stability for both. Then there's the hands-free microphone which is discreetly mounted at the bottom right corner of the car-kit, but if you find that this doesn't provide enough loudness (and I should point out that neither I nor any of the people I spoke to using the device in this default configuration had problems with conversational clarity) it can be relocated to your windscreen sun visor using the supplied extension cable and clips. I suspect the reason that the default location of the microphone proved problem-free is courtesy of the advanced noise-cancelling and echo-cancelling audio system which TomTom has built into the device and which removes most, if not all, background noise for the caller and ambient noise for the driver. Then there's the 'sound boost' function that is provided by the built-in 2 watt speaker which provides excellent voice reproduction during calls, loud and clear satnav instructions while driving and even manages to be a perfectly acceptable music playing device for anyone who doesn't equate in-car audio to rock concert levels of loudness. At just 51.69mm x 157.68mm x 85mm and weighing in at 195g, the Hands-free Car Kit is small but not lacking in power. And I don't mean just in terms of the audio capabilities already mentioned, but rather quite literally not lacking in power. As I stated earlier, and as any user of an iPhone-based satnav app will be all too aware, satellite navigation and GPS usage on an iPhone is an extremely battery consuming activity. If you were to want to drive, following satnav app spoken directions and on-screen mapping, for a couple of hours you would be hard-pressed to do so even if your iPhone were fully charged before you set off. The TomTom Hands-free Car Kit incorporates an Apple 30 pin connector and TomTom 'fast charge' car charger which has been developed to charge devices such as the iPhone which have high power requirements much faster than a standard car charger. On the road this means that your iPhone always stays fully charged while using the satnav app, rather than slowly losing charge even when connected to a car charger. The fast charger itself is a very small and stylish cigarette lighter socket device which accepts the USB connection from the Hands-free Car Kit. What else is there to like? How about the dual phone system which means that you can connect two iPhones simultaneously? Or how about that it can store up to five iPhone keys for automatic reconnection, which is nice for family members and regular passengers. The truly plug and play nature of installation which uses a spoken voice menu to guide the user, informing them of the Bluetooth connection PIN for example, is also exemplary. Even if your iPhone isn't mounted in the device, but is in your pocket, you can still use the Hands-free Car Kit to answer and reject calls using the big hardware buttons. Siri comes into play when making calls as well, but you knew that already. The TomTom iPhone app, I am using version 1.10 with the latest map updates (map updates are included free whenever TomTom release an updated iPhone app), requires iOS 4 or later and is a 'universal app' meaning that it will also be available for your iPad without additional charge. It should be noted, however, that if you subscribe to any in-app extras such as the TomTom Traffic or Speed Camera alerts, then these subscriptions do not work on both devices - only the one you ordered them from. The Hands-free Car Kit itself works with the iPhone 4s, iPhone 4, iPhone 3GS, iPhone 3G and iPhone. Talking of those in-app extras, to be honest these do ramp up the cost of using a TomTom satnav from your iPhone but are pretty much essential if you are serious about your driving. The TomTom HD Traffic service is compatible with iPhone 3G/3GS/4/4S and iPad WiFi + 3G models, and costs an additional £26.99 for a year of service. This provides real-time traffic jam reporting, dropping this data into your route planning and not only advising of any delays but re-routing you via less busy roads if available. With the TomTom HD Traffic subscription active I can honestly say that the Estimated Time of Arrival shown on-screen is frighteningly accurate. The other in-app extra that is worth considering, TomTom Speed Cameras, adds another £16.99 per year and is the subject of much controversy. Mainly as a database of fixed speed cameras comes pre-installed with the app for free, updated with every new release. So why spend extra? That's easy, your subscription brings warnings of mobile speed camera hotspots, traffic light cameras and average speed detecting cameras as well as real-time updates. In my book that subscription equals a small price to pay for peace of mind. There is also a 'micro-USB' version of the TomTom Hands-free Car Kit available which is aimed at the Android and other smartphones market, but I have not tested this personally and so cannot comment upon how well it works on the road. What I can comment upon, though, is the iPhone version and it really is a superb piece of kit. Good enough, in actual fact, to emulate Usain Bolt and do the double: a perfect 10/10 for the TomTom iPhone satnav app and now a perfect 10/10 for the TomTom Hands-free Car Kit for the iPhone as well. Can a Big Lens really turn your iPhone or iPad into a professional DSLR camera?